sooo happy with the results!! Gray fabric and walnut finish MATCHED PERFECTLY!! Ecstatic!! THANK YOU!! Was an easy purchase considering the price and the style. Enhanced my dining room's design the minute I replaced my old chairs with them, unbelievably what a small change can do to a space! 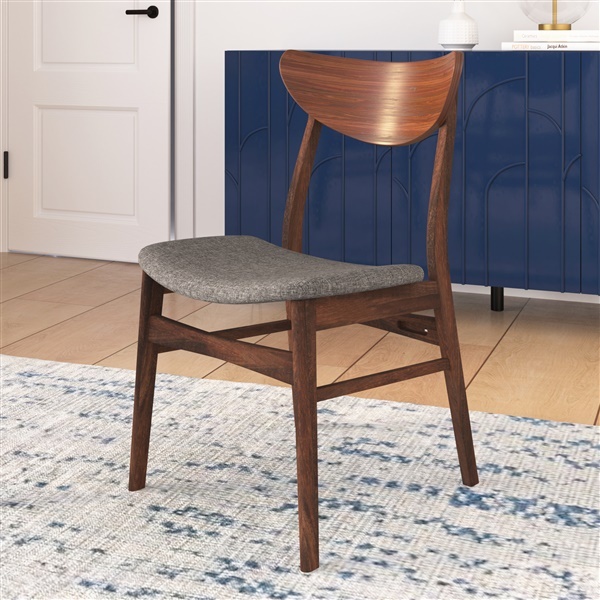 Easy decision ordering these chairs - color, finish and style were the best choice for my dining room, thanks for the fast shipping and fair prices! What a lovely shape these dining chairs have! They are a nice blend of elegance with that strength and durable quality you find in Scandinavian furniture designs. Beautifully crafted! I ordered and received with the scandi dining table - they make an amazingly attractive set and I'm impressed with the overall quality and shopping experience - customer service was informative and helpful throughout the process! Charming design and the backrest curves nicely, it is very comfortable. I purchased 4 with the scandi dining table, they are a perfect match! Loving these chairs. They were easy to assemble and look fantastic around my table. Upholstery is quality and artistic! I even use as an extra office chair at times! I love the upholstery on these chairs!! It's such a great color and texture. The chairs are comfortable and the backrest is supportive. Super affordable too!! Thanks Inmod! ProsVery comfortable, affordable, love the upholstery. Overall I am pleased with the chairs. They arrived undamaged and very quickly. Assembly was straightforward, if a little more time consuming than expected. The backrest of the chair seems to be a slightly lighter wood color than the rest of the chair. Not a huge deal but it is noticeable. Does the fabric come in other colors? The Scandi Dining Chair only is available as shown in the grey tweed fabric. I'd like to use this chair with a Saarinen tulip table. What color top of the tulip table matches closest to this chair? The chairs are finished in a walnut color, which will most closely match the walnut table top. We cannot guarantee an exact match, since the chairs and table are made by 2 different manufacturers. The weight limit for the Scandi Dining Chair is 250 lbs.